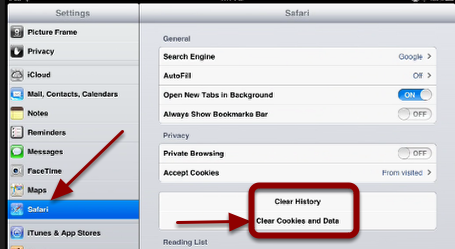 This tutorial describes the process for deleting data and cookies from your iPad. 1. Find your "Settings" icon and tap it. 2. Scroll to Safari and tap it. Then tap "Clear Cookies and Data". 3. Read the warning. Tap "clear" to remove all cookies and cached data. Prev: eBook: How Do I Copy eBook Text to Interactive Whiteboards?